Frank De Felitta's 1981 made-for-TV horror film will haunt Blu-ray in October. 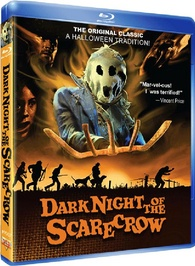 In an early announcement to retailers, VCI will be bringing 'Dark Night of the Scarecrow' to Blu-ray on October 11. When young Marylee Williams (Tonya Crowe) is found viciously mauled, all hell breaks loose in her small rural town. Officious postmaster Otis P. Hazelrigg (Charles Durning) leads a gang of bigots in pursuit of the suspect: her mentally challenged friend Bubba Ritter (Larry Drake). Finding him hiding inside a scarecrow, they exact brutal mob "justice"...only to discover a tragic mistake! Now a strange apparition stalks the land seeking each of them out, as the legend of the Scarecrow begins. Specs have yet to be revealed, but supplements include: Director & Writer Commentary, Daniel Griffith Documentary, Q&A with Larry Drake, Tonya Crowe & J. D. Feigelson, CBS Network World Premiere Promo, Rebroadcast Promo, and Behind the Scenes Photo Gallery. You can find the latest specs for 'Dark Night of the Scarecrow' linked from our Blu-ray Release Schedule, where it's indexed under October 11.